This simple necklace by Coeur de Lion combines pretty multi coloured pastels to create an ideal piece for everyday or occasion wear. 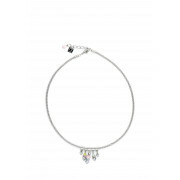 Sparkling Swarovski crystals and rhinestone beads with Swarovski crystals dangle towards the front of this necklace. These elements are finished with a silver-coated and enamelled mesh chain. Matching items are available and this item is presented in Coeur de Lion packaging.